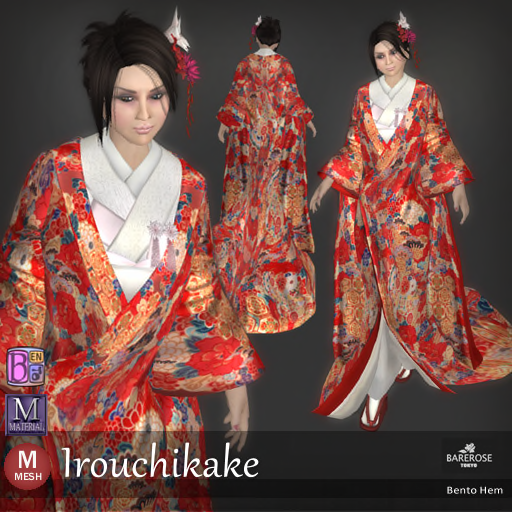 The Irouchikake is the Japanese tradtitional bridal dress and Kitty is going to show you one from Bare Rose today! The Irouchikake have the outermost layer of kimono draped over the entire outfit with the obi hidden underneath it, so you will not see it at all. This elegant embroidery on the kimono is perfect for a glamorous wedding day. From the look, you can tell that the kimono is radiating a aural of happiness and good fortunate so this is the perfect dress for the wedding if you are considering one done with Japanese style.